Educational Qualification: Three years Engineering Diploma in specific branches. Selection Process : The mode of selection is through open Competitive Examination on 20/12/2015. Application Fee : Rs.1000/- (Rs.500/- for SC/ST) to be paid online by Net Banking / Credit Card / Debit Card only. 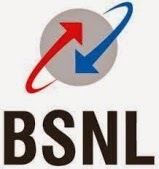 How to Apply : Apply Online at BSNL website from 01/12/2015 to 10/12/2015 only. Please visit http://externalexam.bsnl.co.in for detailed document and online submission of application.